SHOULD ITEMS SUCH as vitamins, minerals and fish oils stay on a reduced tax rate of 0% to encourage people to take them? 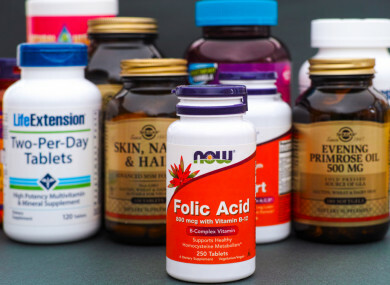 Such products, including folic acid, are to increase to a VAT rate of 23% from 1 March, reports the Sunday Times because some businesses are taking advantage of the low rate. Because of concerns from public health officials, Minister for Finance Paschal Donohoe is expected to bring forward new proposals on the issue. If the rate is increased to 23%, women could spend between €18 and €86 extra on essential supplements over three years, according to specific calculations by the Times. So what do you think? Should vitamins and minerals be taxed at a lower rate? Email “Poll: Should vitamins and minerals remain on a tax rate of 0%?”. Feedback on “Poll: Should vitamins and minerals remain on a tax rate of 0%?”.